June may be the traditional month for weddings, but December and February seem to be the times when many engagements take place! Sooo, I'm trying to stock more vintage wedding dresses and accessories in the shop in the near future. My favourite forthcoming garment is this ivory 1930s satin-lined moire taffeta gown! I am absolutely in love with the deco shaping at the shoulders, the high pointed seaming under the bustline. Swooon! Braided satin headband and 20s/30s satin shoes are all for sale, so feel free to drop me a line via the shop if you are interested! Adventure-filled day yesterday in the City of Toronto. After a fascinating experience watching my hubby get suited up for a friend's wedding over at Tom's Suits, I did a little vintage hunting. Just when I was starting to get discouraged, I found some treasures that are eventually bound for the shop! Me caught in act of fondling vintage. Yeee hawww. Thought I'd try some frocks on for fun. 40s/50s taffeta plaid hostess gown. Not my style, and not in good enough condition for shop, but a dream to twirl around in. The ultimate find: late 1920s-early 30s polka dotted beach pyjamas!!!!! Lovely later 40s floral nylon seersucker frock (needs some freshening, but it will be so lovely as someone's spring dress!). Another comparable pattern-frock pairing: EvaDress's 1927 dress pattern and 1920s chiffon dress in my shop! Okay, off vintage sleuthing in the city today. Wish me luck!!! 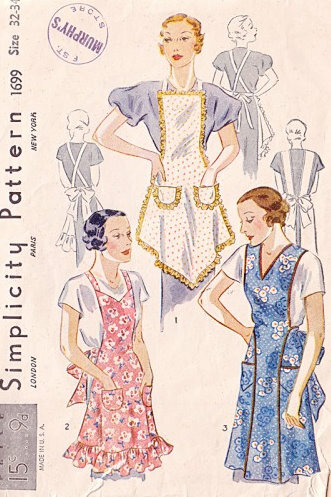 So, I've mentioned more than once about was elated when I found the same style of dress pattern that a seamstress had used to make the vintage 30s dress I had bought from Dear Golden last summer. 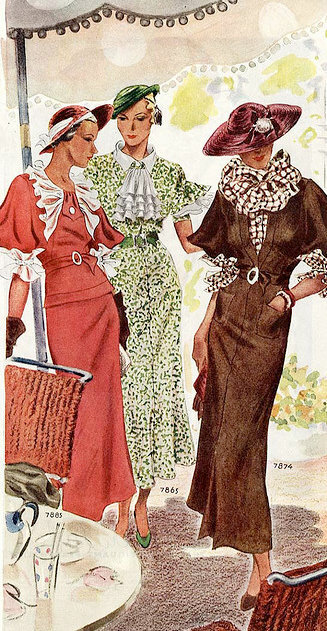 TODAY, I spotted two versions of the same tab & ruffle front frock in some fabulous colour illustrations from 1935 posted by myvintagevogue. The dress in the first image is the twin of mine, just in a different colour. The second one has different sleeves and seems to be a two-piece set with a belt, but the front details on the 'blouse' are again the same. I'm sure it is incredibly weird that I am in an absolute tizz of joy over this, but that's me! So neat neat neat! Sigh...this photo of me in the backyard makes me long for green grass and sunkist skin sooo badly. Sobs. I'll return to the subject of resort wear shortly. In the mean-time, a little outfit post and associated blurb. As a 30s lover, I see some interesting things when I am out foraging for vintage. For some reason, 30s garments seem to mystify a good deal of sellers. 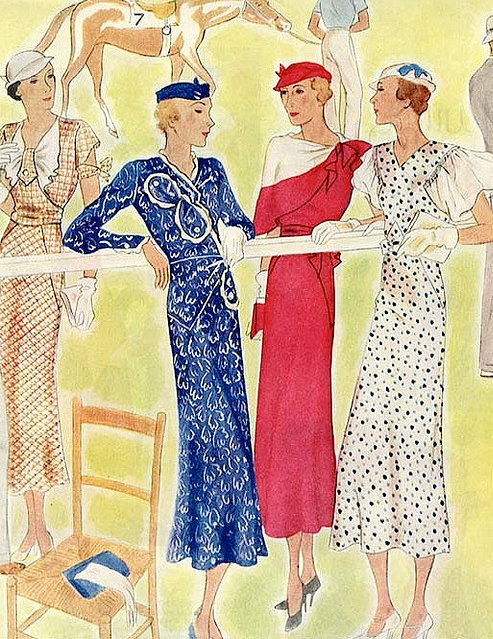 I've blogged before about how I constantly see 1930s bias cut nightgowns sold as evening gowns. I recall commenters telling stories of seeing people out at events wearing these very nightgowns to fancy evening soirees (often none the wiser). Another common mislabelling trend I've seen lately is 20s and 30s bed jackets being sold as evening jackets or lovely day blouses. To be fair, the line between boudoir and ballroom wear was often fine in the 30s. Still, sellers should do their best to know the difference....and buyers have to be on their toes to avoid buying something that they think is something else. Now, if you are deliberately seeking nighties that you want to wear as evening gowns or if you love consciously wearing bed jackets as cute blouses because that is your style, good on ya! I have seen some stylish gals do a fantastic job of repurposing things like bed jackets into darling day or evening pieces. Me, I just can't seem to muster up the right level of self-assurance to wear lingerie as day or evening wear. HOWEVER, I *love* to wear stylish 30s rayon day dresses as cocktail/evening wear (rarely do my evening gowns ever see the light of the moon) AND this Sunday, I'm going to wear a newly acquired cream NRA label taffeta evening jacket over a 30s cotton dress to brunch. 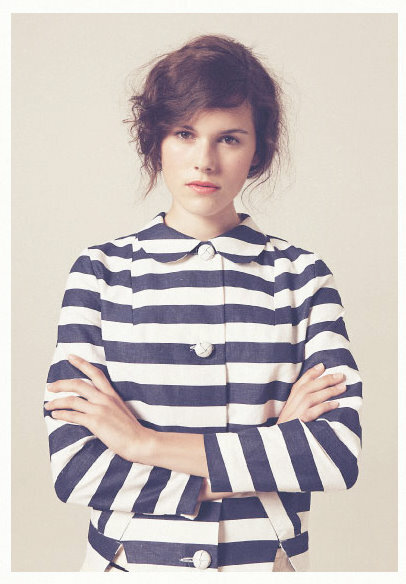 Here's the funny part: this jacket was sold to me as a 40s bed jacket. Confused yet? Last night I watched Follow the Fleet (1936), another Fred Astaire and Ginger Rogers musical flick. While it is not as dear to my heart as Roberta, Bernard Newman's costumes had me drooling once again. As ever, I am unable to give you lovely costume stills because silly old Netflix Canada does not offer this film on its annoyingly slim menu of classic movies, but I can assure you that if you love adorable sailor getups, chic skirt suits, and dazzling evening gowns (including that drool-worthy plaid gown below), you won't be disappointed! 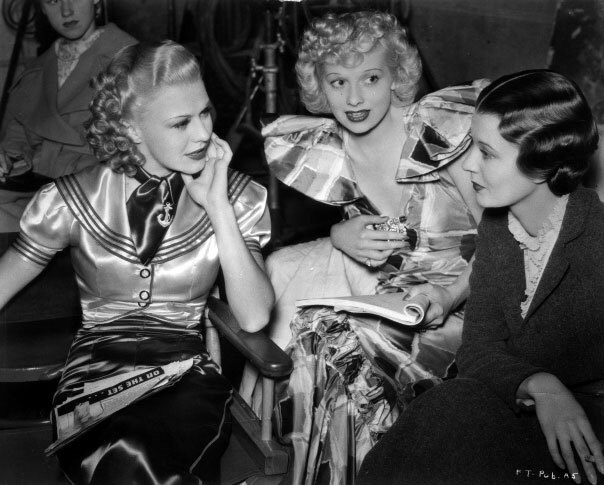 A young Lucille Ball (in centre of first image below) has a part in the movie, too, and I have to say, she stole every scene she was in. Anyway, the costumes have given me some great "resort" fashion ideas (sailor tops and neck scarves and cute little trousers, oh my)! Thanks to those of you who commented on my last post. Your tips for beating the winter blahs have helped already!! Today I feel reinvigorated and ready to list some new goodies in my shop....see below for a sneak peek of some of the items going in the shop. Winter blahs? BAH...nothing a little vintage (and "Lisztomania") can't cure!! This is a song that is keeping me going this winter. In May, resort dreams have a high chance of turning into reality (more on that later this spring). Hello, lovelies! Just checking in to say "I'm still here....er---sort of!" I've got a bad case of the winter blahs, I'm afraid, which has left me with little desire to blog, to cobble together outfits, and to accept lovely blog awards involving me telling you things about boring ole little me. All I really feel in the mood for is daydreaming about warmer climes. So, be prepared. I'm once again starting to go into "resort" mode, which means that if you are somewhere cold and snowy, and images of 30s gals in fashion best suited for sunny beaches make you feel positively frosty, you may want to look away for the next while. Hehe. 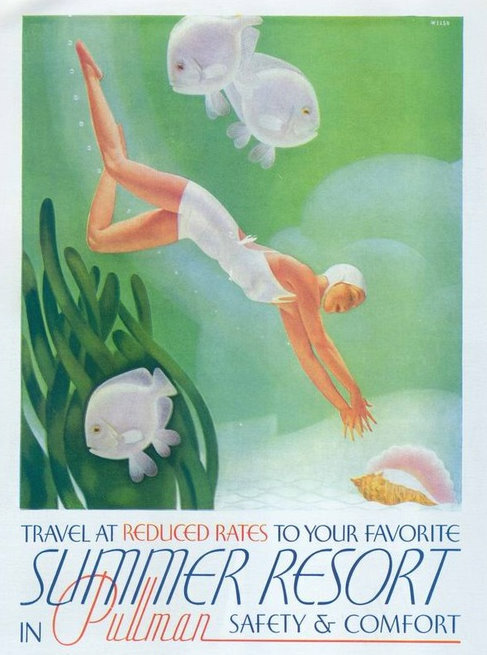 Okay, starting off the resort obsession, I give you this beautiful vintage travel ad, which I am hoping to secure a copy of for over the bathtub. Sighs... how do YOU beat the blahs?? Most of my outfit posts tend to show what I wear out and about. Truth be told, many days (especially Sundays) I can be found at home, enjoying lots o' tea, and cooking or baking. Such was the case today. 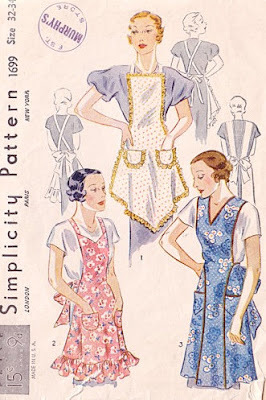 Lately, I've become re-obsessed with 30s aprons (esp. embroidered ones) and feedsack fabric & frocks, so I perked up my mood by puttering about the house wearing my favourite blue bird apron over a blue floral flour sack frock all afternoon (bad lighting in kitchen, I'm afraid, so pic is a bit dark). Of course, the whole day, my mind was a-whirring with plans that may or may not ever come to fruition: plans to try my hand at embroidering once again (I used to embroider with my grandmother almost every weekend as a girl) and plans to add a few feedsack aprons to my sewing project list. Sigh....so much Sunday Sweetness, so little time! Last year, I did a little post about a Ruby Keeler-inspired collection by London design house, Colenimo. 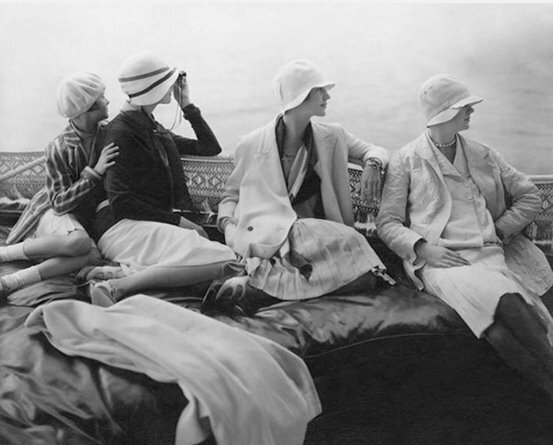 When I heard Colenimo's Spring/Summer 2011 collection was again inspired by vintage style (in this case, one of my favourite Edward Steichen photographs ever--from 1928 see below), I immediately rushed to their site to pore over their style book. 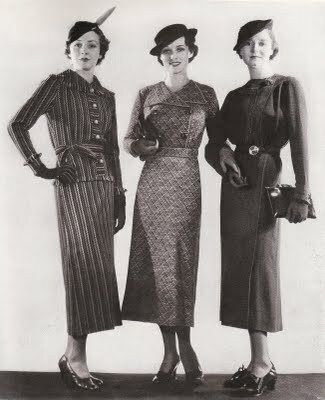 In the end, some of the clothes are cuuuute, but I like the actual vintage fashions worn by the women in the photos better. 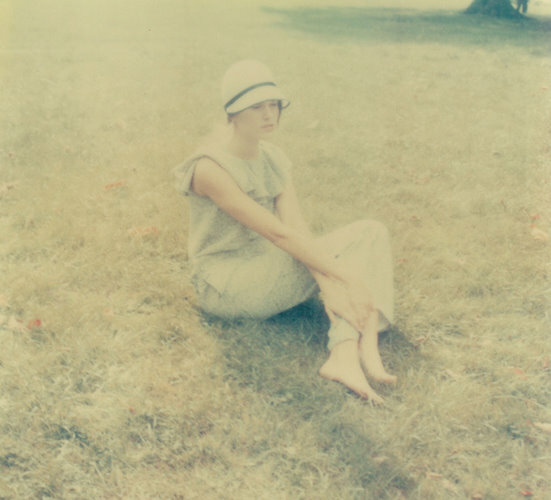 Really, the only re-occuring connections I could make between the Steichen image and the collection were a hat worn by the model and the use of linen. 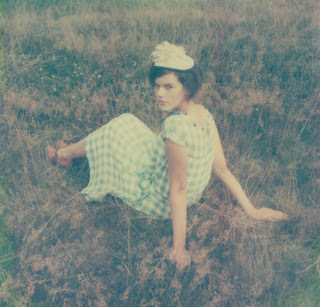 I noticed some 30s-dustbowl esque flutter sleeved gingham and floral dresses that were really darling, but farmer's daughters walking barefoot in the country grass represent a whole other homespun aesthetic that has little to do with the breezy aristocratic resort style shown by the ladies on the yacht, so the Steichen influence is a rather removed one in my humble opinion. Anywhooo, what do you think? Once upon a time, an amazing dress made its way to me. As if by magic, it came at a time when I was contemplating some major life decisions and was looking for some sort of celestial guidance or signs that I was going in the right direction. Some may find it silly to say, but my sign came in the form of this dress!! It had the most glorious blue jay print on it..a most positively auspicious symbol, as blue jays were my beloved grandfather's favourite avian friends. A year later, I've crossed the threshold to a new life. A glorious life filled with more quiet bliss and genuine contentmant than I ever thought possible. Today, I decided it's time to let this piece of wearable luck and beauty fly forth into the arms of another vintage lover. May these blessed blue jays bring whomever buys this special special frock the same joy!! Don't get me wrong...the longing for clothes as light and pretty as spun candy and macarons has already begun. Can't get enough of the pastel pink, yellows, blues, and greens which spring clothes (and handtinted postcards!) from the late 20s and early 30s display to best advantage! I've probably posted at least one of these videos many times over, but who cares? I want flapper clothing eye candy! Like many of you, I reaaaaallly can't wait for spring and I've already started thinking about what to wear next season, once the snow goes. However, the fact is that it's still cold and wintry where I am, so I started looking back over my archive of fall and winter 1930s images...when what to my wandering eye should appear but an image that captures lovely ladies from Fall/Winter 1934 clad in hats and dresses that look just like two items that are shop bound: I just love warm brown...like hot cocoa on a wintry afternoon. After days of cabin fever, we finally decided to brave the snowy weather for a day of tea (at my favourite little tea house in town) and Matisse (some of his works are on display at the local Art Gallery). 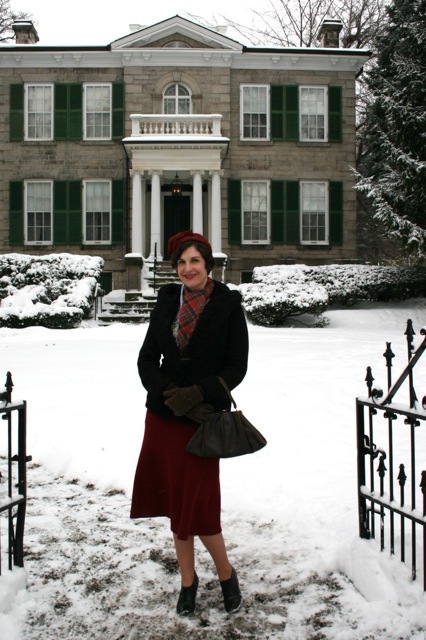 Since we parked near my favourite historical site, Whitehern House, I couldn't resist a little baronial photo op. 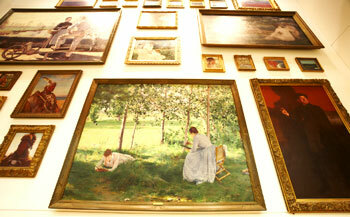 While inside, I learned of an amazing local early 20th century artist whose works I had never seen. His name was William Blair Bruce paintings and his works were just gorgeous. His use of colour, the sense of movement and detail in his huge canvases, his ability to capture light and shadow=WOW. Anyway, this ended up being my perfect sort of day: a peaceful and civilized little outing centred around tea and art! Didn't hurt to have an excuse to wear some of my favourite vintage items out and about either. Lovely day!